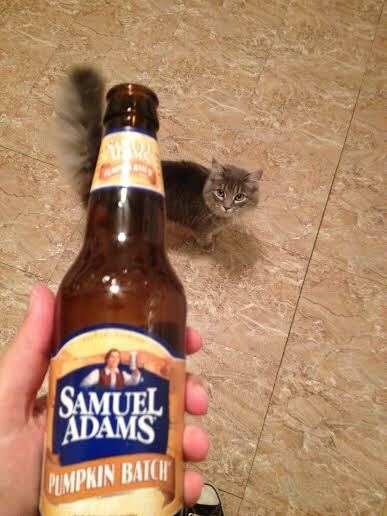 Up first, guest reviewers Luke and Hannah’s take on Samuel Adams Pumpkin Batch! Deciding to switch up a seasonal brew is always an exciting new kid at school addition for any brewery, and the anticipation I’ve felt at the thought of Samuel Adam’s Pumpkin Batch, a pumpkin saison, has been palpable. Readers from past seasons may recall my dislike for both Harvest Pumpkin Ale and Fat Jack – surely Pumpkin Batch could turn the pumpkin tides for my adopted hometown’s beloved (so big it’s almost not) micro-brewery. This saison pours a clear golden orange with only trace amounts of lacing. For a pumpkin ale, the aroma doesn’t contain any of the usual suspects for spices, just a healthy dose of flowery Belgian yeast. Though real pumpkin, ginger, and all-spice all claim to be in this beer, the only people at this ummmm party? are meekly roasted malts, some nutmeg, and even less cinnamon, along with the yeast from the aroma which creates a chalky aftertaste.